SANTO DOMINGO, Feb 5 2016 (IPS) - A middle-aged woman arranges bouquets of yellow roses in a street market in Little Haiti, a slum neighbourhood in the capital of the Dominican Republic. “I don’t want to talk, don’t take photos,” she tells IPS, standing next to a little girl who appears to be her daughter. Other vendors at the stalls in the street market, all of them black women, also refuse to talk. “They’re afraid because they think they’ll be deported,” one woman whispers, as she stirs a pot of soup on a wood fire on the sidewalk. That fear was heightened by the last wave of deportations, which formed part of the complicated migration relations between this country and Haiti – the poorest country in the Americas, with a black population – which share the island of Hispaniola. According to official figures, the Dominican Republic’s migration authorities deported 15,754 undocumented Haitian immigrants from August 2015 to January 2016, while 113,320, including 23,286 minors, voluntarily returned home. “This process has a greater impact on women because when a son or a daughter is denied their Dominican identity, the mothers are directly responsible for failing to legalise their status,” said Lilian Dolis, head of the Dominican-Haitian Women’s Movement (MUDHA), a local NGO. “If the mother is undocumented then the validity of her children’s documents is questioned,” she told IPS. The latest migration crisis broke out in 2013 when a Constitutional Court ruling set new requirements for acquiring Dominican citizenship. The aspect that caused an international outcry was the fact that the verdict retroactively denied Dominican nationality to anyone born after 1929 who did not have at least one parent of Dominican blood, even if their births were recorded in the civil registry. This affected not only the children of immigrants, but their grandchildren and even great-grandchildren. 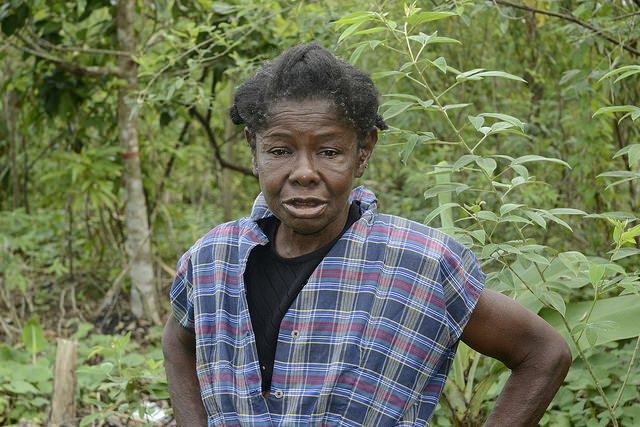 Tens of thousands of Dominicans of Haitian descent were left in legal limbo or without any nationality, international human rights groups like Human Rights Watch complained. In response to the international outrage, the Dominican government passed a special law on naturalisation that set a limited period – May 2014 to February 2015 – for people born to undocumented foreign parents between 1929 and 2007 to apply for citizenship. But only 8,755 people managed to register under this law. At the same time, the authorities implemented a national plan for foreigners to regularise their status, from June 2014 to June 2015. Under this plan, 288,466 undocumented immigrants, mainly of Haitian descent, applied for residency and work permits. But only about 10,000 met all the requirements, and only a few hundred were granted permits. Since August, the police have been carrying out continuous raids, and undocumented immigrants are taken to camps along the border, to be deported to Haiti. 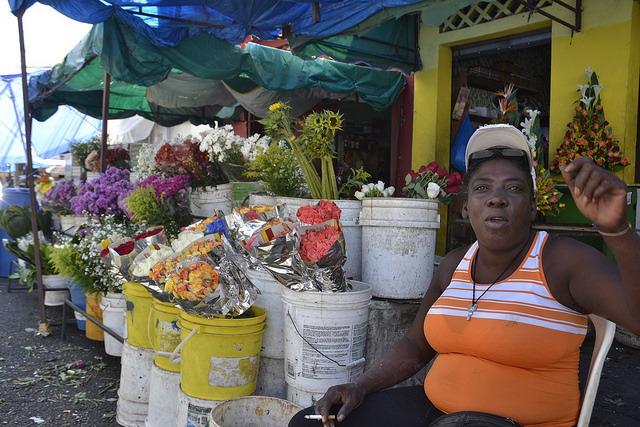 “Most Haitian women work outside the home; very few can afford to be homemakers,” said Antonia Abreu, a Haitian-Dominican woman who has sold floral arrangements for parties, gifts and funerals in the Little Haiti market for 40 years. “Those who work as decent people have integrated in society and contribute to the country,” she told IPS. Among the unique mix of smells – of spices, open sewers, traditional foods and garbage – many women barely eke out a living in this Haitian neighbourhood market, selling flowers, prepared foods, fruit and vegetables, clothing, household goods and second-hand appliances. The small neighbourhood, which is close to a busy commercial street and in the middle of the Colonial City, Santo Domingo’s main tourist attraction, has been neglected by the municipal authorities, unlike its thriving neighbours. No one knows exactly how many people live in Little Haiti, which is a slum but is virtually free of crime, according to both local residents and outsiders. Most of the people buying at the market stalls in the neighbourhood are Haitian immigrants, who work in what are described by international rights groups as semi-slavery conditions. 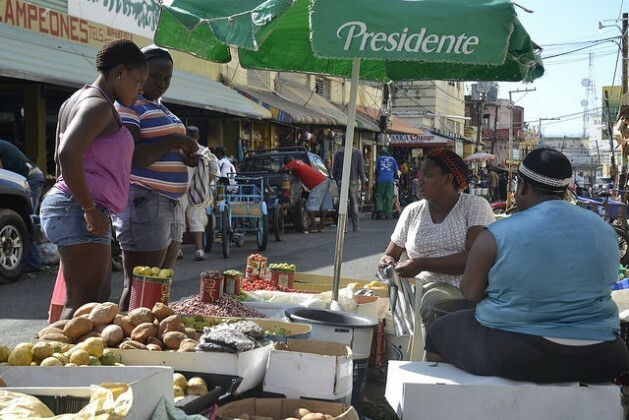 The street market is also frequented by non-Haitian Dominicans with low incomes, in this country of 10.6 million people, where 36 percent of the population lives below the poverty line, according to World Bank figures from 2014. In this country with a deeply sexist culture, women of Haitian descent are victims of exclusion due to a cocktail of xenophobia, racism and gender discrimination, different experts and studies say. Haiti-Dominican Republic Trade: Exports or Exploits? The activist was referring to the last available population figures gathered by the National Survey on Immigrants carried out in 2012 by the National Statistics Office with UNFPA support. At the time, the survey estimated the number of immigrants in the Dominican Republic at 560,000, including 458,000 born in Haiti. The lack of up-to-date statistics hinders the work of Mudha, which defends the rights of Haitian-Dominican women in four provinces and five municipalities, with an emphasis on sexual and reproductive rights. The movement is led by a group of 19 women and has 62 local organisers carrying out activities in urban and rural communities, which have reached more than 6,000 women. Mudha says the Dominican authorities have never recognised the rights of women of Haitian descent. “They’ve always talked about immigration of ‘braceros’ (migrant workers), but never ‘braceras’ – that is, the women who come with their husbands, or come as migrant workers themselves,” Dolis said. Since the mid-19th century Haitians have worked as braceros in the sugarcane industry, the main engine of the Dominican economy for centuries. But today, they are also employed in large numbers in the construction industry, commerce, manufacturing and hotels. Dominican Republic law has required at least one legal parent since 1929. Otherwise children don’t get dominican citizenship at birth. The same is done by about 80% of the countries worldwide. There’s also a 1938 agreement by both nations to keep undocumented people out of each others territory. A 1944 dominican law requires at least one parent of a child to show a valid ID in order to get dominican citizenship at birth. This 1944 law, and not racism, is why most of the mentioned haitians do not have dominican papers. I wish these articles would focus on why the relief money for just misteriously vanished. A step in the right direction.